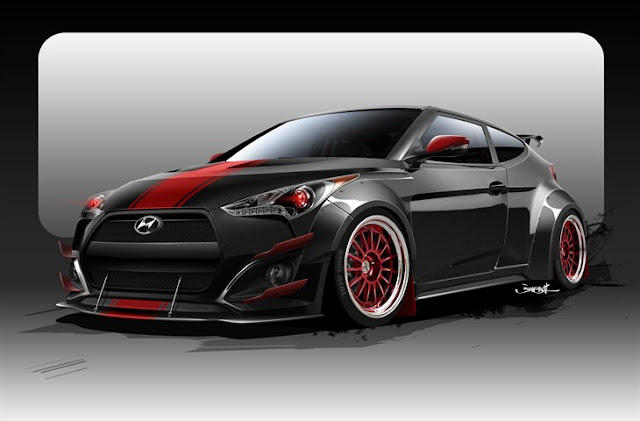 Before its Genesis Coupe arrived on U.S. shores back in 2009, Hyundai didn't have an official presence at SEMA. But in the years since the release of the sporty, rear-wheel-drive performance car, the brand has steadily increased it's footprint at the annual automotive aftermarket carnival. For 2015, Hyundai is bringing three different models to the show, from several difference segments in its lineup. Handling the Genesis Coupe will be seven-time SEMA veterans ARK Performance, which started by boring the standard 3.8-liter engine to 4.0 liters and later adding a custom Rotrex supercharger system. Along with some beefed up internals, that means the mill will be good for 500 horsepower and able to give the ride the performance its low stance and wide body kit implies. Chicago's Blood Type Racing is behind the carbon-black Veloster Turbo R-Spec, which has been tuned to produce a whopping 500 horsepower from its standard 1.6-liter block. The car also adopts an all-business, fully-caged interior, red LED headlights and a flared carbon fiber body kit. If the power-to-liter ratio doesn't sound insane enough, Blood Type is promising a motor that's fully street-able, with a factory-level of refinement. For an off-road entry, there will also be a Tucson built by Rock Star Performance Garage, which raised the former grocery getter up six inches and added 32-inch Mickey Thompson rubber, adjustable shocks from King, and—because this is SEMA—a booming system from Kicker. All the cars will be revealed on the show floor during Hyundai's SEMA press conference on November 3. And from what we know about SEMA builds? Each is a long time from being ready for prime time yet. The 48th running of the SEMA trade show runs from November 3-6 at the Las Vegas Convention Center. For more of our coverage on the event, head to our dedicated hub.